It sounds like a crazy idea: take a stand-up paddleboard on an overnight trip. But considering the crazy things people do with these boards (crossing Georgian Bay in the winter, yoga, fishing, etc. ), it isn’t that out of line. And if you can muster up the gear, the time and the location, the second you hit the water you’ll know all the planning was worth it. Here are a few tips to get you overnight SUPing. One of the greatest things about an overnight SUP trip is it forces you to pack light. Nothing but the essentials are coming with you. There’s really no other choice: you don’t have much room, so you can’t take much gear. Once you embrace that fact, it’s a liberating experience. Ideally, plan your trip for mid-summer when the water is warm and you’ll just need some board shorts and a few t-shirts. You’ll need a tent, a sleeping bag, food (preferably freeze-dried or dehydrated fare), and water (or a water filter). If you’re going with friends, this is the time to divide and conquer; one person takes the tent, one takes the stove, one takes the water filter, or combinations thereof. You don’t want to paddle too far, against a current, into the wind or through choppy conditions. A short non-whitewater river trip would be great, or a quick turn-around along a shoreline. The campsite at the McBeath Conservation Area on the Saugeen River is perfect. Exploring the Georgian Bay shoreline around Killarney is also well-suited, as are some of the lake campsites in Algonquin Park, or the beach on Christian Island. Your route is limited only by the availability of water-accessible campsites. This can be a deal-breaker on an overnight SUP trip. It’s a fact that too much wind, big waves or a strong current can take a lot of the fun out of these trips. You’re very exposed on an SUP, so if a storm is imminent, you may want to reschedule. Frustrating, but it’s best to play it safe on an SUP. Of course, you’ll need to own or rent the right gear to make this happen. 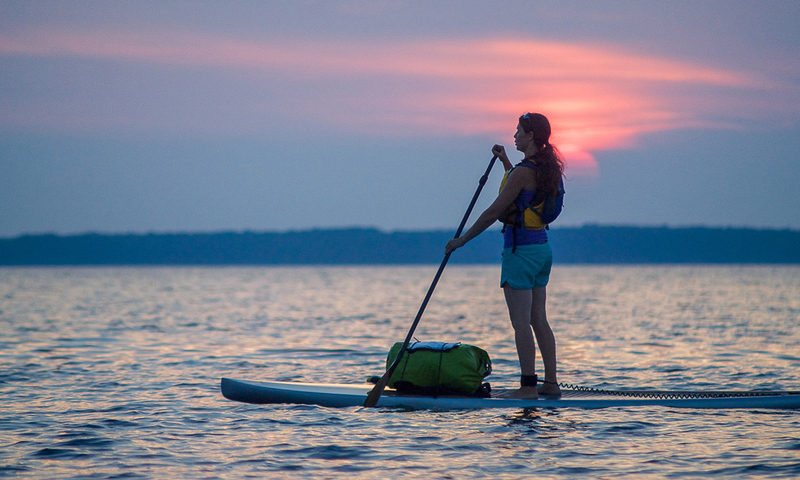 A touring SUP – a longer board (usually 12-14 feet) with a displacement hull for better glide and tracking, and tie-downs on the deck – is essential. As is a drybag. Ideally you can use one large drybag for stuff like sleeping bags and spare clothing, and a smaller one for the snacks, sunscreen or camera that you’ll need throughout the day. If a tent seems too bulky, you could try a bivy sack or a hammock. Want to see these tips put to work on an epic multi-day trip around Vancouver Island’s north west coast? Check out feature on paddling Cape Scott by SUP.